Franklin Monroe’s Nychelle Cool celebrates with her teammates after scoring a goal for the Franklin Monroe girls soccer team in a scrimmage against Lehman Catholic on Saturday in Sidney. 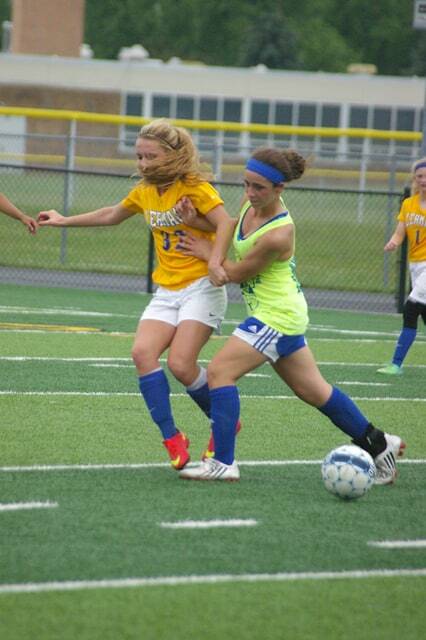 SIDNEY – The Franklin Monroe girls soccer team is showing strong chemistry that has coach Scott Howell feeling confident about the upcoming season. The Lady Jets spent the weekend playing scrimmages against Lehman Catholic, Sidney and Troy at Sidney High School. FM has 14 high school players for the upcoming season and brought up a few eighth graders for the scrimmages to fill in for some missing high school athletes. The team didn’t have much practice time prior to the scrimmages but overall did well in the games. At this point the teams’ chemistry seems stronger than in past years, Howell said, which is a good sign. The Jets are working well together and playing well. Being early in the process, the results of the weekend’s scrimmages didn’t matter to Franklin Monroe. Rather, the Jets were simply looking for continuous improvement. While the start of the season is still a couple months away, things have been going well for the Jets.